A lot of us would like to improve their skin complexion. I can understand that fair skin is so much desired in India and this is why the skin lightening creams sell like hot cakes. 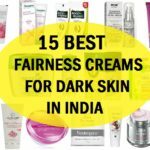 To help you choose better, I am going to share this list of the best fairness creams in India for men and women along with their reviews and the updated price list of 2019. 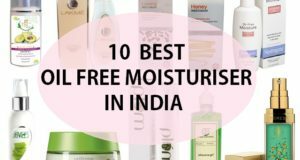 The list also includes even the fairness cream that Indian men can try.These are unisex products by the way that can be applied daily. Skin can get darker and dull because of the sun tanning, dirt, dust and pollution. We tend to lose our natural complexion and get darker. I always say that skin whitening home remedies are safer than the store bought fairness products. But that is also true that we cannot roam around during the day applying some home recipe. Right? This is why we go for skin whitening creams that protects and lightens the skin through out the day. There are various formulations like the fairness serums, gels, medicated creams and what not. 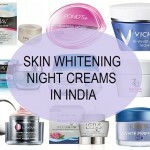 There are whitening creams for dark and dusky skin as well. We’ve compiled this list to help you choose the right face cream for your skin type. 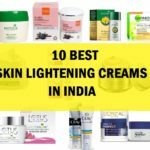 Here’s the list of top skin lightening and fairness creams that are available in the Indian market easily. Some of them are skin whitening creams for oily skin, dry skin while some can be for all skin types. o, let’ see what are these skin whitening creams that one can try without the side effects. This skin whitening cream has sunscreens (SPF20) thus, can be used during the day time and also has vitamins and honey which induces the skin lightening and anti aging effects. It has a nice scent which is good and not harsh and without the possible side effects. It is rich in mulberry, licorice and saffron extracts. It is the best skin whitening cream in India for everyone. This Garnier white complete skin cream consists the revolutionary molecule that is one of the best agents for skin whitening which has the power of 10 times Vitamin C. Vitamin C is a known skin lightening agent. It protects the skin from UVA/UVB rays and also improves the skin color to get fair skin in just 2 weeks, as per the claims. 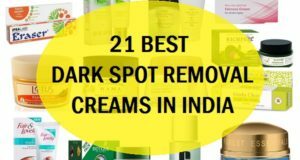 I would call it as the best cream for fairness and dark spots in India that both boys and girls can use. This Lakme skin whitening cream comes in a pretty grayish jar packaging. This is formulated for all skin types and for men and women. This is the best skin brightening day cream is enriched with Vitamin B3 which nourishes the skin. The Lakme fairness cream also smoothens the skin texture with its botanical ingredients. 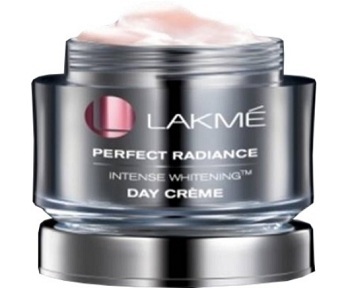 Read the review of this Lakme Perfect Radiance Intense whitening day cream and decide yourself that this is good for oily skin. 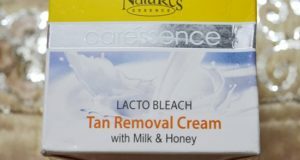 Many people have termed this as one of the best skin lightening cream for oily skin available in India. 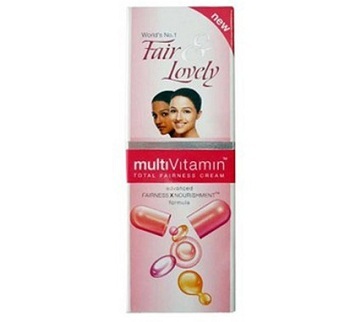 L’Oreal Paris skin whitening cream is formulated with Vitamin B3, vitamin E and C, thus it not only give the lightening of skin but also give anti aging benefits. I have used this and it is for all skin types but may not be very moisturizing cream for the skin type that is dry. For oily skin, it is the best fairness cream for glowing face and whitening for girls and boys in their 20s. Biotique is a herbal skin and hair care brand. 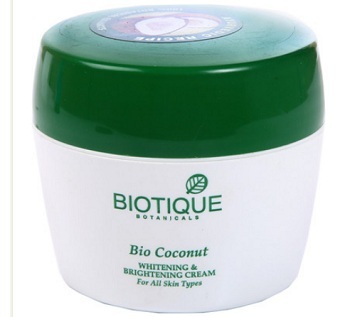 This Boutique Ayurvedic skin whitening cream has extra virgin coconut oil and other botanical extracts. 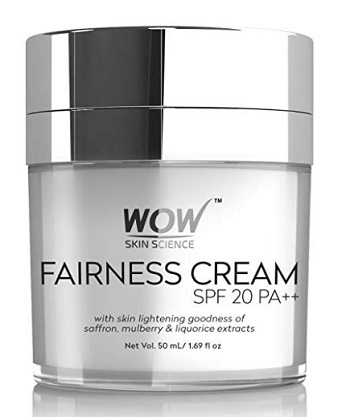 This is one of the best fairness cream for dry skin for brightening and hydration but I will not recommend this to the oily combination skin types as it can be slightly comedogenic that means it can clog the pores. You can call it a product for the winters for dry skin because of its coconut extracts. 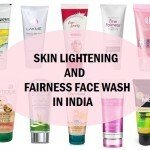 Fair & Lovely is by far the most popular skin cream in India wit SPF protection and I hope you will agree with me. This new version has a pump for easy usage and SPF 15 with multivitamins. I used this and it was good for everyday use. Just a tip for oily to combination skinned boys and girl, if you truly want fairness then other than using these skin whitening creams, you should also exfoliate the skin 2 times in a week. It will really make a positive difference in getting the glowing skin. 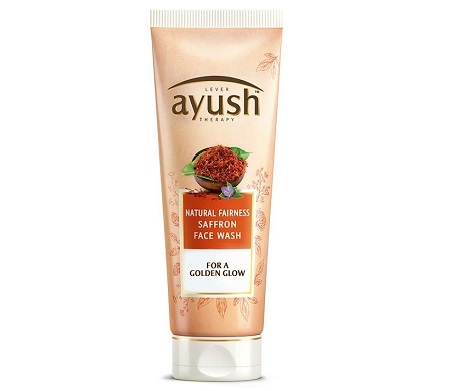 For this, an Ayurvedic fairness cream version is also available that you can consider. 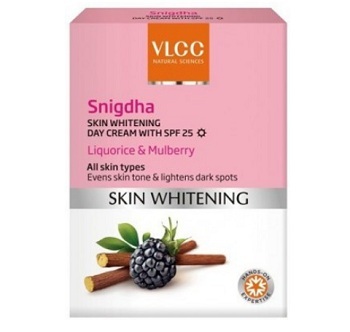 This fairness cream from VLCC claims to give an even toned skin for a nice smooth face and also lightens the pigmentation on the skin. This is enriched with the Wild Turmeric, lemon peel, Mulberry and liquorice. Liquorice helps lighten the skin while turmeric and lemon peel improves the texture and fades marks. Mulberry reduces the melanin formation in the skin. It may not be a good choice for oily skin though. It is not a hydroquinone-free cream. They also have a night lightening cream, so you can complete the whitening regimen from the same brand. This skin fairness cream from Ayush herbals has the natural extracts of ingredients like aloe vera, saffron, kumkumadi tailam, lodhra etc which does multi functions for the skin. It even tones the skin, helps reduce the darkness and patchiness without making the skin greasy or oily. This Ayurvedic daily use lightening cream does not have any bleaching agent hence gives a natural fairness to the skin. Lotus herbals gel crème is best for oily skin lightening as it has a gel like creamy formula it is light weight and doesn’t block the pores or make the oily to combination skin greasy, even in the hot season like summers.. It gets absorbed really quick for a glow and brightness. It is more like a regular use toning cream for your dark skin. The SPF 25 also makes it the best day face cream for daily use. This is the latest launch from Olay and it is a light in weight skin serum which helps to lighten the skin complexion. It is easy to absorb and it’s non greasy texture is good for the oily to combination skin though dry skinned ones can also try it. Olay natural white fairness cream is rich in the vitamins and has a nice texture which is easy to blend. If you have the typical acne prone skin then also this lightening serum cream can be applied. This face lightning cream is also effective for getting rid of the sun tan that makes you dark. Among so many version of spot lightening and skin whitening creams from Pond’s, this one is slightly expensive and has a light texture. That is why good for summers for all skin types. Pond’s white beauty cream contains Vitamin B3 complex. 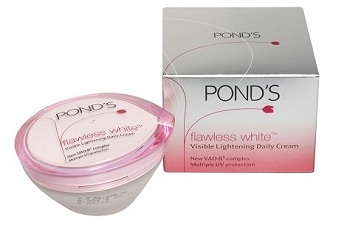 Read the review to check out yourself about this Pond’s white beauty lightening day cream. 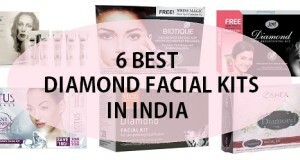 You can also consider few more of these facial whitening creams for your face. 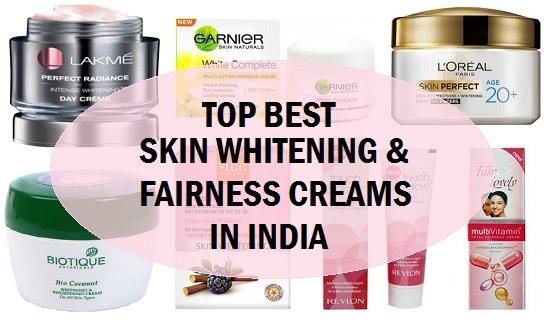 How to Choose Skin whitening and Fairness Creams? Face whitening creams can help you lighten the sun tan and also to polish the skin.But you should always choose these lightening whitening creams as per the skin type, as if the creams are not chosen well you can have acne, comeodones etc. This is why a lot of people will ask which is the best whitening cream for oily skin, dry skin etc. Oily skin: Creams that are too thick can be comedogenic as they will block the skin pores while the creams which has light gel like texture is good for oily and acne prone skin. 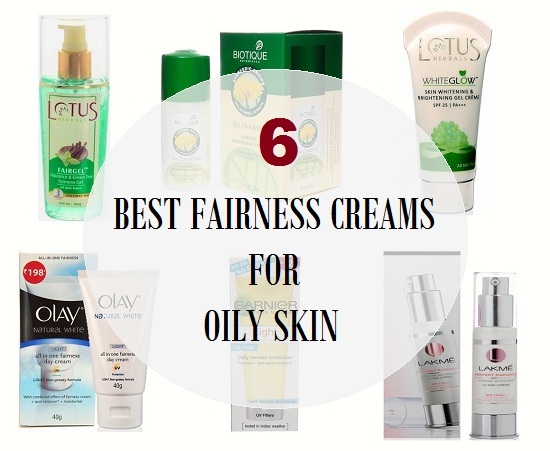 For dry skin: Opting for fairness creams with more hydyrating formula is great. Another thing to keep in mind is the price. If a skin whitening cream is pricey that does not mean that it will be very effective in making your skin fair. So, stay away from the price factor. Most of these whitening creams work by only whitening the uppermost skin by fading the sun tanning. 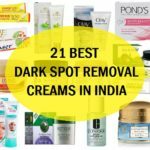 So, these were the compilation of the some of the best and worth trying skin whitening and fairness skin creams in India. Which is the one that you have tried? Which is your favorite out of the lot? Skin whitening products don’t just work like that but you have to think that you should take care of the skin in natural ways too like putting sunscreen, applying face packs and also drinking loads of water. Mam am using normal cream products that are available in the market. So far i dint get my skin fairer. My skin is little normal look and it changes more darker if i went in sun. My skin is dry and sensitive. Kindly suggest me best skin lightening cream for every day usage. I want to get the results soon for fairness skin. Hi Nesa, You can try using Lotus herbals whitening and brightening gel cream. I use that and it is good for sensitive skin. Try using sunscreen as well as this will prevent the skin darkening due to sun. You can try Lotus whiteglow day gel creme and Lotus white glow night cream. they both are very good. Yes, sure Olay is also a good brand and I have used their night cream worked well for me. For the tan removal try applying some tomato juice daily on the tan and wash after 20 minutes. Rather than a cream use a sunscreen that will give sun protection and they will not get dark further. You can try Olay natural white fairness cream that is good or ele try Lotus whitening or brightening gel cream. 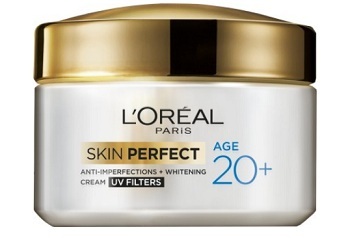 mam my age 23.. i have normal skin and normal colour.. suggest best cream for best fairness.. I think you can try Lotus brightening and whitening gel cream. I like that as this is not expensive and is a good cream for daily use. You should use sunscreen when you go in the sun and you can also try Lotus whiteglow gel cream. This is good. You can also apply some papaya juice on the face and wash after 20 minutes this will lighten the skin color. You should always use sunscreen when you go out in the sun, this will prevent the sun tanning and skin darkening. you can also try Lotus whiteglow gel cream. This is good. You can also apply some tomato juice on the face and wash after 20 minutes this will lighten the skin color. try this daily. I am 14 yrs old, and have tan on my face and relatively darker complexion.. will garnier naturals work 4 me?? Yes, you can try that but I will suggest to completely get rid of the tan you should daily apply some tomato juice on the face in the evening and wash after 30 minutes. this will improve the complexion and also takes off the tan. 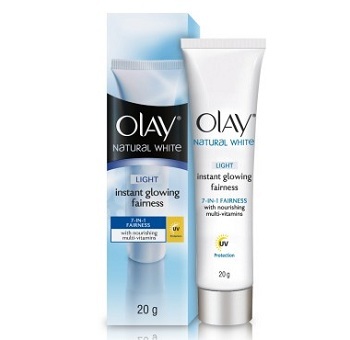 You can try Olay natural white fairness day cream that is good for combination skin. Hi mam my skin is oily and combination ,my skin tone is normal also am doing night shift . Can you tll me which cream should I apply. I am 25 years old. You can use Lotus whiteglow night cream I like that cream and this has non greasy texture. For depressions on the skin, there can be expensive procedures but I can tell you remedies for the acne marks and spots for that you can try some lemon juice on the spots at night and wash in the morning. You can sue multani mitti face pack every other day this will make the skin tighter and slightly lighter. You can also use tomato juice on the face then was after 20 minutes. This can be tried everyday for skin whitening. I will advise you to try fruit facial and use honey on the face daily and wash after 15 minutes. This will help you a lot. Hello.i am 14 year old boy.when i was born i was so much fair.but now my chest is too fair and face is so much darker.my skin is combination type.what cream should i use …mam? You can try Spinz sun tan remover cream that just has to be applied for 5-10 minutes like a face pack then wash it. You can also daily apply some lemon juice on the hands and feet at night then wash in the morning for better results. I think that is due to the sun tanning hence you can can use Lotus whiteglow gel cream and always use sunscreen before applying cream when you go in the sun. Hi Minaxi, I will suggest u to try Lotus herbals white glow gel cream. Other than that daily apply lemon juice and honey mixture on the face. wash after 30 minutes. This needs to be done in the evening. This will give you good results. That may be due to sun tanning. i will suggest you to us e a sunscreen when you go in the sun. To get rid of the darkness on the hands the easiest remedy will be to apply some tomato juice and wash after 1 hour. This can be tried daily an hour before you for to bed. it gets dry within 5 minutes so won’t restrict you from doing work. You can use a scrub by mixing of rice powder and honey. This is best for face and body as well. Honey will nourish your dry skin. For the face pack, you can mix some oatmeal with honey and lemon juice. Apply o the face and wash after 20 minutes. This can be used 2 times in a week. Hi Lisa, I think you can try Lotus herbals whiteglow gel cream. I like that cream for its texture which isn’t creamy but more like a gel cream. First of all, i will suggest you to scrub the face 2 times in a week. So that the skin pores are clean and there is no dead skin cells. I think you have oily combination skin type. An easy solution will be to take half teaspoonful of honey and half teaspoonful of lemon juice. mix them and apply on the face wash after 30 minutes. Do this daily and the face will be clearer again. A lot of us ace this problem that we get dark very soon when we go in the sun. For that I will advise you to use sunscreen so that your color doesn’t get darker. I am not aware about that skin cream so cant say for that. But you can try using roop mantra cream my mum uses that and that has worked well for her. 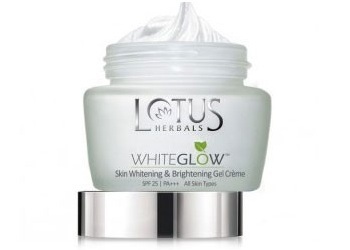 You can also try Lotus whiteglow gel day cream. You are welcome Meenakshi, You can try Lotus whiteglow gel day cream. I like that cream due to its light texture. Hi mam.i have use lakme foundation cream.i am fair. But I want more fairness.so, which cream & soap I am used.pls suggest me. HI mam my skin type is oily.can you suggest a face cream suitable for me for whitening.also recommend some brand names. You can try applying some tomato juice on those spots. They will fade. Scrub the face 2-3 times in a week. In that case you can try using Roop mantra cream. 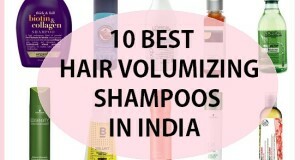 Try using Himalaya or VLCC sunscreen if Lotus doesn’t suit you!! For the marks, you can apply tomato juice at night and wash in the morning. You can try Lotus herbals whiteglow cream for the day time. HI,My face is normal.And i want to use day and night cream which one will you suggest.Please suggest me the best cream. Ma’am, my skin becomes very oily in summer and gets dry in winter season. I can’t understand which category is my skin in, neither I am able to decide what can remove my acne scars and blemishes. I am also having large open pores because of the pimples. I become fair in moderate weather but darker in winter and summer as well. Can you suggest me, what should I prefer? Thank you so much. I have been using foundation cream of candylove for a while now which has really proven to be great as it was suggested to me by my salon artist. I will see if they have a similar product and buy as the quality of their product seems best in the price range for sure.